Diamonds may be a girl’s best friend but some would call them a woodworker’s best buddy. It’s been over a century since DeBeers cornered the diamond market creating an artificial shortage of gem-quality diamonds that exists today. But that shortage and the resulting high prices of what are, in actuality, rather common gems spawned a diamond manufacturing industry in the mid-fifties that is still growing rapidly today. The ubiquity of diamond abrasives is a direct result of that enterprise – virtually all of the diamonds available for sharpening are manufactured, not mined. Diamonds are a near-perfect abrasive medium, being the sharp particles of the hardest material known. DMT is a leader in the diamond sharpening industry with a large catalog of diamond honing devices, plates and gadgets. Diamonds are stuck down to a steel plate with nickel plating holding them in place. The plating process sometimes includes a “clump” of “rogue” diamonds. These consist of an extra diamond particle or two piggybacking onto one that’s properly stuck down. This creates a larger than desired grain on the surface that will cause large scratches on the tool being honed. These rogue diamonds are why diamond “stones” need breaking in. You can use them hard with blades that you can risk having large scratches in, or you can gently rub two diamond plates together under running water to knock off the rogues and create a uniformly graded surface. I found this break-in requirement the only “con” to the diamond plates that I tested. Diamonds are also available as loose, graded-grains, though more commonly they’re mixed into a paste. Norton’s diamond paste honing kit comes with four syringes with 5grams each of different grit-size diamond paste, color-coded so you know which size is which at a glance. The kit includes four pieces of MDF to be used as the embeddable substrate, one for each grit size. I found these best for polishing but be careful to avoid grit contamination. Store each block in its own plastic bag between uses to keep them clean. That’s it for the Abrasive Personalities posts. Most sharpening abrasives are covered under the four categories. If you feel your knowledge and experience may be of benefit to others, please post a comment. Oilstones are still favored by many for their hard, stay-flat-ness and general reduced maintenance. Oil helps prevent rust but it can interfere with some finishes; so, like water, it’s best contained. The oil of choice can be many things; there are brand-name honing oils, mineral oil, baby oil, 3-in-1, 20W, diesel oil, ATF, etc. I use light hydraulic oil because I happen to have a bucket of it and it works very well – clean, clear, odorless. Don’t use any oil that dries such as linseed oil. You’ll clog the pores of the stone irreparably. Adam Cherubini uses oil stones with a spray of soapy water instead of oil. He just grates some Ivory hand soap into a sprayer and adds water. The surfactant action of the soap keeps the steel particles in suspension in the water and he prefers the water to oil in his shop. He recommends cleaning the stones well first, even if they’ve been used with oil, by running them through the dishwasher (you might want to do this when your spouse is away) before switching from oil to soapy water. Oilstones have become less popular over the years, and some natural grades have been nearly mined out, becoming quite rare. Traditionally they’ve been mined, in North America anyway, in the Ouachita Mountains near Hot Springs, Arkansas. They’re composed primarily of a form of silicon dioxide known as novaculite. The more common grit sizes of natural oilstones are called Washita, Soft-, and Hard Arkansas, Black Hard and Translucent. Manufactured oilstones are India (aluminum oxide grit) and Carborundum (silicon carbide grit). The silicon dioxide in novaculite is not as hard as aluminum oxide or silicon carbide; hence the slower cutting action of natural oilstones; the grit grains are worn dull and the cutting action slows. Even though oilstones offer a hard surface that wears slowly, they do wear down and need flattening from time to time. A diamond plate works best for this and will flatten an oilstone efficiently, exposing new, sharp grit at the same time. Oilstones cut more slowly, almost like they’re being more careful. I find sharpening on oilstones a bit meditative, the abrasive seeming to burnish and polish as much as cutting away the steel. Honing film is the least expensive way to get started with a sharpening system. For very few dollars you can have an enormous range of grit sizes, a flat thing or two to stick the film to (glass, granite, etc.) and you’re ready to sharpen all the way to 0.3µ (that’s the Greek letter “mu” that stands for micron, one of which is one millionth of a meter) if you so desire. (By the way, that’s a very small particle. We’re talking 0.0000118” which translates to the size of the scratch that particle makes on the steel. Most bacteria are measured in the one to ten micron range.) The grain size on honing film is more uniform than it is in most other abrasive applications. 3M claims that 90% of the grit on their honing film is the same size. In the world of abrasives, that’s a very high degree of uniformity. The grit is aluminum oxide, which is much tougher and lasts much longer than the silicon carbide used on the black wet-or-dry sandpaper sheets. The “film” of honing film is Mylar – tough and waterproof. Though I use the films dry some like to spray a bit of slightly soapy water on the surface to help prevent clogging or glazing of the surface. I buy honing film with the pressure sensitive adhesive (PSA) backing because, while I am a bit lazy, I find the factory applies stickum in a more uniform layer than the one I try to spray on myself (and I do get it on myself sometimes.) The PSA sheets that I’ve used have been reluctant to let go, however, and leave behind a mess of glue when removed from my glass substrate which then needs to be scraped off; making the removed film non-reusable. If someone knows a brand or source for PSA-backed honing film that can be removed and reused, please post a comment for us. While a honing film setup may have a low entry fee, the sheets do wear out and after umpteen replacements will end up costing more than a set of stones would have if you had started out with them. But for a low-cost sharpening kit, and to find out which grits you prefer to use before investing in stones, honing film is a great way to go. I have two pieces of ¼” glass the size of the honing film sheets: 80µ on one side, 15µ on the other side of one piece of glass, 5µ and 1µ on the other. With this setup, shown above, and the ruler trick, I can prep one of our Krenov-style blades to shaving sharp in less than a minute. Honest. The range of sharpening media for hand-honing applications is fairly well covered by oilstones, waterstones, diamond plates and honing film. Each of which has its own pros and cons, adherents and detractors (this is interesting: http://blogs.popularwoodworking.com/editorsblog/Tool+Review+WorkSharp+To+Sharpen+Wide+Tools.aspx or http://tinyurl.com/yggz25a). You may, and probably do, have one or more of each of these abrasives, and that being the case you’ve probably joined one camp or another. If not, the following posts are for you. Different tools require different abrasives and techniques. Sharpening a carving gouge applies considerable force against a small area of the abrasive surface: force enough to crush a groove into a soft stone, and hence a harder stone is called for. Chisels and plane irons need a surface that is flat, one that stays that way or is easily re-flattened. So, one must consider which tool will be sharpened when shopping for stones or whatever. According to the survey (url above), waterstones are the most popular abrasive for sharpening. As their name indicates, waterstones are used with water to both lubricate the grinding action and to remove the swarf (the slurry of steel and abrasive particles) from the surface, keeping the grit grains exposed to do their job efficiently. Some brands need soaking in water and can even be stored in water while others, so-called ceramic waterstones, are used with a splash of water and are never soaked. Either way, you’ll have water around when using waterstones, so protect your project’s surfaces. Also, protect your steel tools and parts to avoid rust. I recommend some sort of stone pond to mitigate the mess – Shapton, Veritas, maybe Rubbermaid. Apron, paper towels, WD40 also go on the recommended accessory-list for waterstones. In general, waterstones cut very fast due to their friability (they wear down easily, exposing fresh, sharp grit all the while) — we like this about them. They are truly self-sharpening – refreshing themselves while you’re using them. But they may not be wearing flat while doing so. Flatness is a critical feature for the surface that sharpens chisels and plane irons — not so much for shaped edges like carving tools. So waterstones need frequent flattening to get the best from them. You can use specially made flattening devices like those from Shapton or Norton. Or you can use a diamond plate or sandpaper on a flat surface. Some woodworkers just rub their waterstone on a cinder-block or on the sidewalk outside the shop. Others prefer using loose silicon carbide grains on an embeddable surface, such as a sheet of plastic on a flat surface (lapping). The soft plastic immobilizes the grains to lap the stone flat. I’ve used the Shapton stone flattener and it works like crazy but it’s expensive. Norton’s stone flattener needs occasional flattening itself (much less often than the stones do) but does a fast, aggressive job truing up the stones. The Norton and King are two brands of stones that are soaked before using. I store mine in a Rubbermaid container and two of them have been soaking continuously in there for many years. They cut aggressively and do a great job of sharpening. I flatten them before each use. I’ve heard complaints that these stones are so soft they sometimes need to be flattened while sharpening one blade. If that’s the case, you may be skipping an abrasive step and asking a too-fine stone to do more than its share of the work, thus wearing it too quickly. If you try to jump from, say, a 500-grit stone to a 4000-grit one, the 4000 may take too long and you may wear it down too much. Adding an intermediate grit or two should be more efficient. The Shapton and Naniwa Super Stones are examples of the no-soak ceramic waterstone. These are formulated differently and need only a splash of water to perform their best. They must be kept wet during use, but not soaked or stored in water. Because of the ceramic formulation, they tend to stay flat longer. I found both brands to work very well and even though I flattened before each use they needed only a quick truing up. The initial buy-in for waterstones may seem steep but they last a long time and your investment will pay off in the long run. If you are unsure of what grit sizes to buy, I’d suggest asking your woodworking friends what they use and perhaps trying and testing their stones. Or visit a woodworking supply store to try out their demo models. If a sharpening class is being offered it would be a great way to learn and experiment with different abrasives. Honing films as sharpening abrasives will be the next blog topic. They offer an inexpensive way to learn which grits you like the most – intel you can use when you’re ready for the leap to waterstones. And I’m hoping this post will generate a few suggestions for grit sizes, brands and suppliers in the comments below. 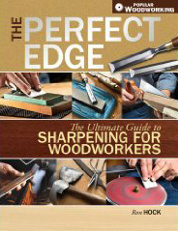 My sharpening book, The Perfect Edge: The Ultimate Guide to Sharpening for Woodworkers, Popular Woodworking Books, ISBN 978-1558708587, 224 pages, over 400 photographs, charts, graphs, circles and arrows, etc., is due to be available in mid-December. The official release is in January but they’re teasing me (and you, I hope) with talk of an earlier date. I will have books available, signed if you wish, on the HOCK TOOLS website and you should be able to pick up a copy “wherever books are sold.” Try your local bookstore first. Metallic Glass: Material Of The Future? Hardness vs. Wear. An overview of material hardness and wear resistance. Old Philippine pics: log cutting with a chainsaw on Flickr – Photo Sharing! Timberrrrr! on Flickr – Photo Sharing! Linda and I just returned from the Woodworking in America Conference at Valley Forge. The Popular Woodworking Magazine gang did us all proud once again, putting on a well-planned, well-executed show. It’s always a treat to see old friends and make new ones. As the greater Philadelphia area has an abundance of wonderful things we stayed a couple of extra days visiting as many of them as our tired feet would allow (I’ll try to post about the Mercer Museum and the Wanamaker Organ when I get the photos organized). Our thanks to everyone at PWW for such a great opportunity and to all of you who attended. We sincerely hope it was worth the effort. I know it was for us. Across the marketplace aisle from the HOCK TOOLS booth were Joel and Tim from Tools for Working Wood and Gramercy Tools. In the interest of full disclosure I’ll say right up front that these two are friends of mine. I can say without reservation that Joel knows more about the history of woodworking and its tools than anyone I’ve met (except maybe Chris Schwarz). And Tim is a remarkably talented designer — both in the graphic and mechanical arts. The cylindrical part has a spiral slot that, when rotated, bears against the vee-shaped arm. The vee-shaped arm levers out, closing the jaws with considerable mechanical advantage. A few degrees of twist applies plenty of muscular squeeze to hold the saw securely. A bewildering variety of classic saw vises are available now and then on the used market, some better than others. New ones, not so much. It’s not a big job for a woodworker to make one, either. But if you’re looking to buy a quality saw vise, the Gramercy Saw Vise is a solid, well-designed, well-made, affordable vise that will hold up under the roughest use through several lifetimes and look good on the bench. Nice work, guys. And it was good to see you again.